Definition - What does High Lunge Pose mean? High lunge pose is a beginner yoga pose that strengthens the legs and the whole lower body, stretches the hips and groin, opens the chest, and strengthens the arms. Starting in standing forward bend, the knees bend and one leg steps backward, placing the ball of the foot on the mat. The front leg creates a right angle with the knee right above the ankle. Hands press into the mat, torso lengthens forward and lays on the front thigh. Back leg is straight, knee presses up toward the ceiling, heel stretches toward the floor. Shoulders roll back and down while the chest presses forward. The gaze points forward. High lunge pose may also be referred to by its Sanskrit name, utthita ashwa sanchalanasana. There are several variations of this pose. 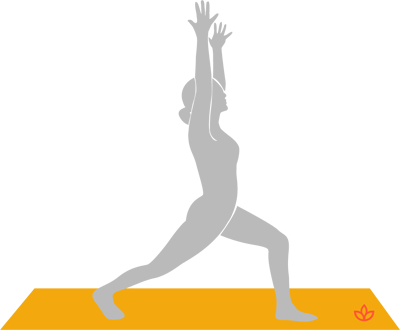 An easier variation is low lunge pose, where the back knee is bent and lowered down to the mat. A slightly more challenging version of this pose is its crescent variation, where the torso lifts upright with arms straight up, reaching toward the ceiling. Practicing high lunge pose can help with indisgestion, constipation and sciatica. It should be avoided by people with serious knee or hip injuries or neck problems. If one suffers from neck pain, it is recommended to look down at the floor instead of looking forward in the final posture. One may also use yoga blocks and place them under the hands or under the back leg.